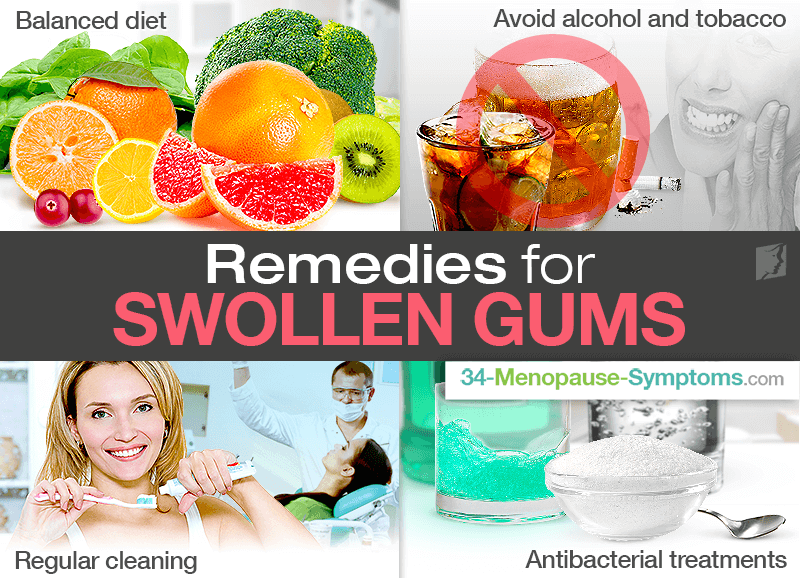 Most women will experience swollen gums at some point during their life, as the skin in this area of the body is particularly thin and therefore susceptible to inflammation and infections. Even with good dental care, it is possible to experience problems, but with some knowledge about the common causes and ways to treat swollen gums, it should be possible for you to alleviate them quickly if they do occur. These are usually caused if you damage your mouth accidentally while brushing your teeth, or if braces or dentures irritate the gums; however, they can become infected and cause further problems. These will most often appear in the small gaps between the teeth and gums, and are an early sign of the presence of bacteria. Blisters can be particularly uncomfortable. Healthy gums should be pale pink, but if they become infected or inflamed, they will usually change to a darker pink or red shade. While of course good oral hygiene is recommended, it is important to take care of your teeth and gums by not brushing them too harshly, as this can cause breakages in the skin that could easily become infected and sore. Those who do not consume enough fruits and vegetables are at risk of suffering from a number of problems. Specifically, vitamin C is needed for good oral health; without it, gum tissue becomes weaker and more vulnerable to infections. It is possible for some reactions to allergens to cause swollen gums. Allergies to oral hygiene products are rare, but do exist; additionally, food allergies can have an impact on the mouth and gums. When bacteria that naturally coat the teeth are not cleaned away regularly or thoroughly, they infiltrate the gums, causing an infection. This is known as gingivitis, and it is estimated that around half the population has it in some form. If your gums become swollen, or you are concerned that you are experiencing the onset of an infection, it is sometimes possible to assuage this early on by gargling a saltwater solution or antibacterial mouthwash. It is advised that you brush your teeth at least twice a day, as well as and frequently floss and use mouthwash. It is also suggested that you visit a dentist once every six months for a check-up and thorough cleaning. These irritate the mouth, so they should be avoided if your gums are sore or swollen, as they can worsen the situation. Avoid a vitamin C deficiency by consuming plentiful fruits and vegetables; five portions per day are recommended. The chance of contracting an infection is relatively high because of the vast quantity of bacteria that inevitably enters the mouth every day via food, drink, and day-to-day habits. But you can decrease the chances of experiencing swollen, bleeding gums by maintaining good oral hygiene and considering your diet and personal habits.